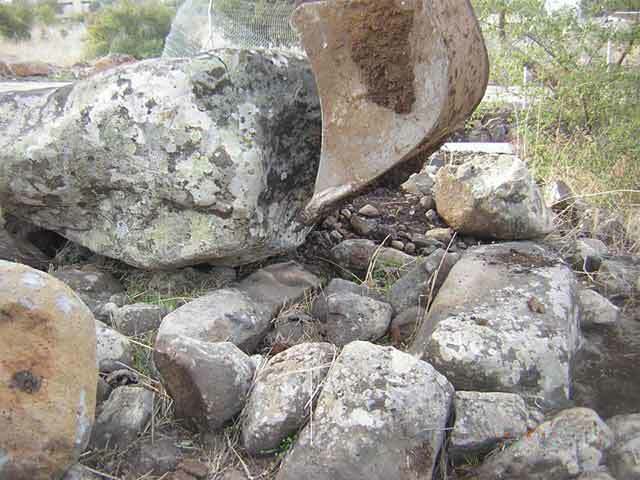 During December 2010, a salvage excavation was conducted in a dolmen north of Qibbuz Shamir (Permit No. A-6071; map ref. 26202/78633), in the wake of damage caused to it by the installation of a water pipeline. The excavation, undertaken on behalf of the Israel Antiquities Authority and underwritten by the Mē Golan association, was directed by O. Zingboym, with the assistance of Y. Ya‘aqobi (administration), H. Tahan-Rosen (drawing of finds) and M. Hartal (guidance). R. Bar-Nur, a member of Qibbuz Shamir, helped in the excavation. 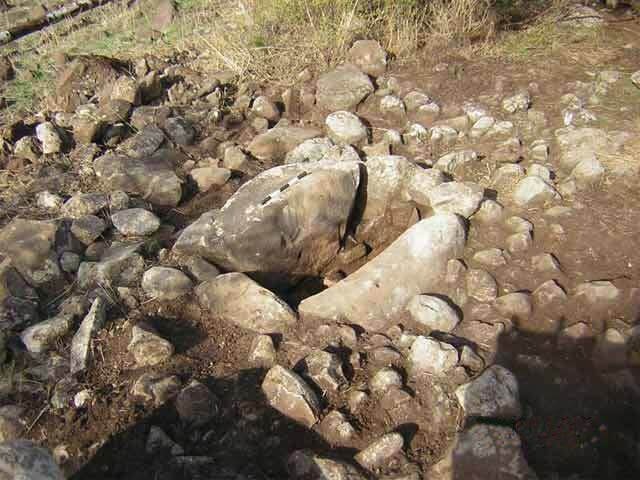 The region of Qibbuz Shamir, located on the foothills of the Golan Heights, is known to be a large dolmen field. Surveys in the region had been conducted in the past (Me-Tikufat HaEven3: 33–39 [Hebrew]) and several dolmens were excavated (Eretz Israel 11:58–63 [Hebrew]; IEJ 22: 44–46); a few were situated next to the current excavation area (HA-ESI 121). The excavation was carried out in a rocky area of Delwa Basalt from the Odem flow,descending from east to west, until the foot of Tel Anafa. A single dolmen with a rectangular burial cell in its center, covered with a large basalt stone, was excavated (Fig. 1). Upon removal of the covering stone (1.7 × 1.8 m; Fig. 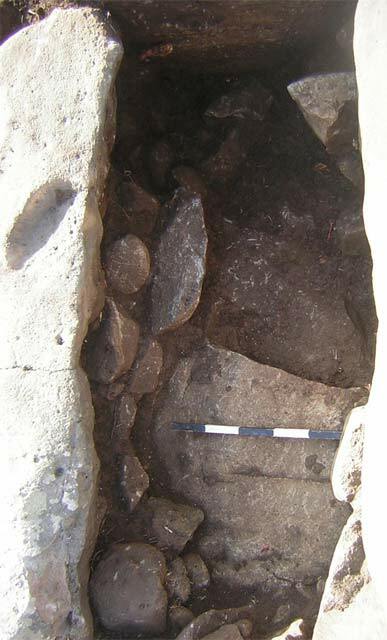 2), the burial cell (0.80 × 1.62 m), which was built of large basalt stones and aligned northeast-southwest, was excavated. The floor of the cell consisted of small stones that were used to level the bedrock surface (Fig. 3). 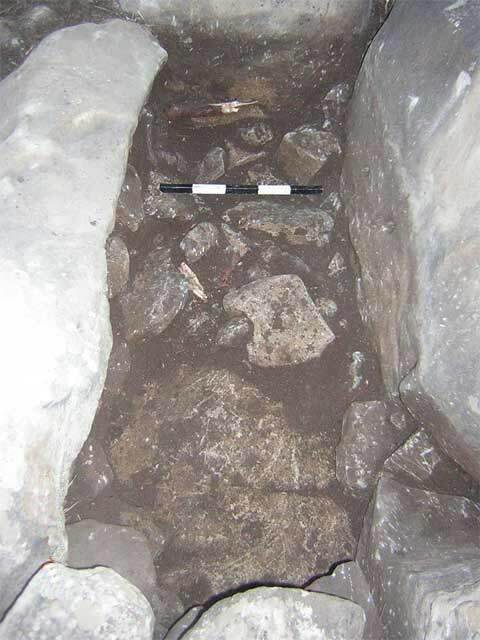 After cleaning the floor, it was removed and the excavation continued down to bedrock (Fig. 4). A bowl fragment (Fig. 5:1) and the bottom of a clay juglet (Fig. 5:2) that dated to the Roman period were found in the burial cell. The remains of two stone circles, whose plan is unclear, were found around the cell, and it is obvious they were damaged by a tractor working in the area. It is evident that the burial cell had been plundered in antiquity, probably in the Roman period. The finds from the excavation are insufficient to draw any conclusions regarding the date of the dolmen’s construction. 1. The burial cell and remains of the two stone circles, looking north. 2. Removing the covering stone, looking southwest. 3. The floor of the burial cell, looking northeast. 4. The bedrock surface after removing the floor, looking northeast.